. : TOTTI’S DAY: FAREWELL, CAPTAIN! The weeping of ''er Pupone'' (Italian people call him this way) was accompanied by the soundtrack of the movie ''The Gladiator''; his hug to his children, The King Lion song, Ennio Moricone's music, Francesco Totti's close-up face on the giant screen and when the songs by Antonello Venditti started from the speakers of the Olimpic Stadium, we were all in tears. It was impossible not to be moved. It's strange, everything appeared so beautiful but at the same time extremely sad. So many people followed the farewell to football of a champion, a man, who has never left his club, Roma , for more desirable and international destinations. His loyalty was amazing and it is a rare thing in the world of nowadays football. ''Totti is a Gladiator as his tattoo says'' his supporters said regarding his football career, ''his goals are masterpieces and we will never forget them, as well as his “spoon” or his assists''. His fans will never hardly feel those emotions again. 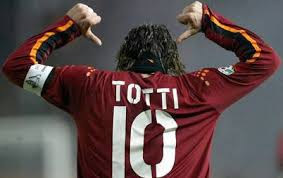 Last Sunday was called ''Totti Day'', emotions the no-one wanted to end. At that moment Francesco Totti took off his captain band and put it on the arm of a boy: a very young footballer of Roma club that was , for his supporters, a bridge between past, present and future. 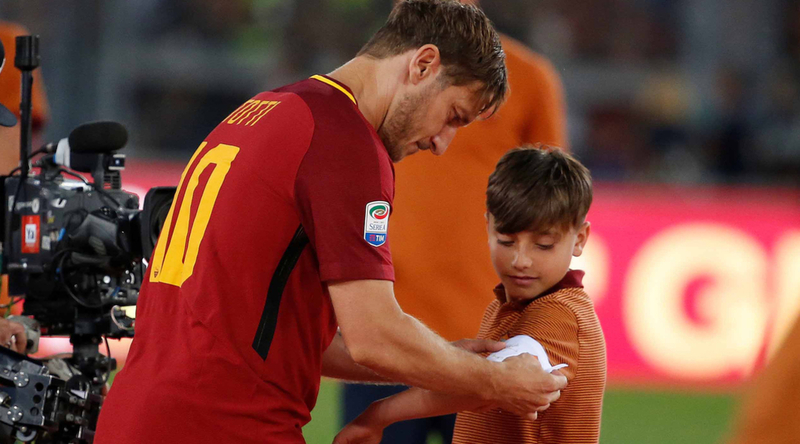 For Mattia the boy, it was a moment he won't forget for the rest of his life. Totti took leave from Roma Club, after an infinite field ride, with his last ball kicked in the grandstand, called ''Curva Sud'', on the ball there was written '' I will miss you''. The right epilogue for a soccer fairy-tale. Here are the most significant events of Totti’s career. Debut and first goal in Serie A. ''Let's get the boy to the field'' these were the Mihajlovic's words the 28th Marc 1993, In the Rigamonti stadium in Brescia. Francesco Totti’s story started then. On that day he also scored his first goal, the first of his 250 goals in Serie A. Sliding doors. Roma Team risked to lose Totti when the football manager Carlos Bianchi decided to sign a loan to take him to Sampdoria Club and, subsequently, when Milan Club wanted him. 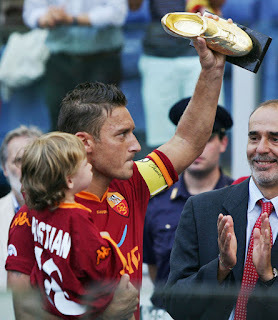 It was almost done but, fortunately, Totti played the last matches very well and the president decided to keep him. There’ll only be one Captain. In 1998 Totti received the Captain band by Brazilian Aldair. Mo je faccio er cucchiaio. It means ''Now I'll give him a spoon'', his famous penalty. During the European Championship kicked his first ''spoon'' to Van der Sar, playing against Holland. Let's take Madrid. 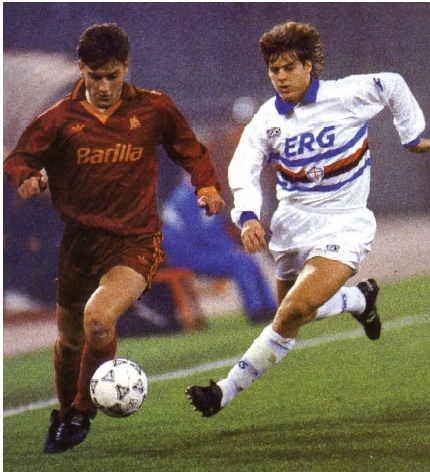 There was a time when Roma defeated Real Madrid! Villa Stuart-Berlin-Circo Massimo. It was the year of the World Championship. 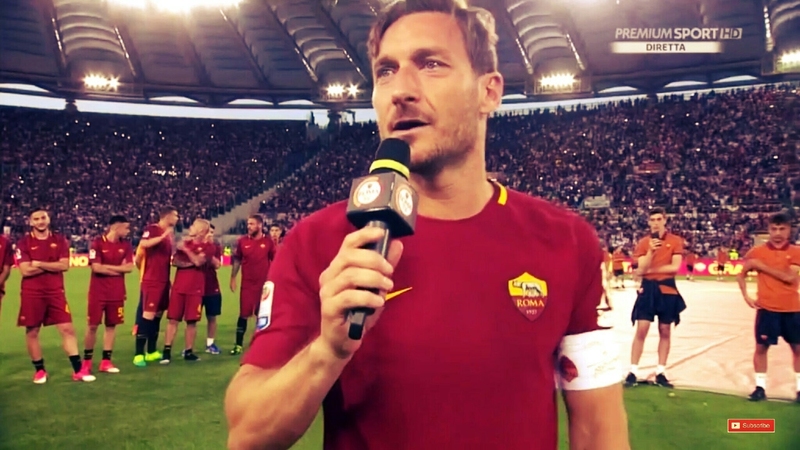 During a match against Empoli, Totti got injured, so it seemed that he wouldn't go to Berlin to play the World Cup. Instead, he surprised everyone and went to Berlin to raise the Cup to the sky. He became the longest-active footballer to score in the Champions League. In the last great championship final, he reached 300 goals with Rome Club. 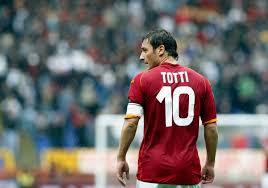 What Totti did on the field will remain in the history of football. THAT’S SO RAVEN IS COMING BACK! THE THIRD MILLENNIUM SHERLOCK HOLMES! REIGN: LONG LIVE THE QUEEN! YOU TUBE’S ANCESTOR: MY SPACE! WELCOME TO 221B BAKER STREET! CAVES, CAVES AND MORE CAVES! THE HISTORY OF THE JOKER!